What’s In Your Pickup Bed? Around 1992, I was without a hot rod so, I began looking for something to build. I like many brands so, I was open to many different options. I came across a 1955 F100 in the old “Pennysaver” magazine, a roller, with no motor or transmission for $275, so I went out to look at it, and decided to buy it. My thinking was, big engine compartment, room for a big engine! It was a good start. I tore it down to the bare frame and started by having that blasted & painted, I made sure that none of the original cross members had been cut out, as the result is frame twist. So, with a solid foundation the build began. Keeping it short, it was a complete frame off build and I chose to use a Ford Racing 521 short block and a Don Hampton spec top end for this 871 supercharger race kit, which was Blue Thunder high port heads with a matching blower manifold and Don’s 871 blower. Bruce Crower, a friend of Hampton’s, custom ground the blower camshaft for our design goal of 1,000 HP and a redline of less than 7,000 RPM’s. Since I worked as a Divisional Manager for the speed shop chain Super Shops for a decade, I called everyone I knew for deals on parts & advice. I rounded out the drivetrain with a Top Loader 4 speed with overdrive and a 9-inch rear end. Now the interesting part began, but you’ll need some history first. My father worked at Douglas Aircraft in the late 50’s & early 60’s in their missile division, working on the “Thor” ballistic missile and others. As kids, my brother Tim and I were able to go to Vandenberg AFB and Pt. Magu to watch missile launches with Dad. These were exciting times; the race to space was on, Mercury, Gemini and Apollo and of course the cold war and the development of ballistic missiles. After launches, on the way home, in our AMC Rambler Station Wagon, we would tell my Dad to put a rocket motor in the back of the wagon, we’d be like the “Batmobile!” My Dad would just laugh. 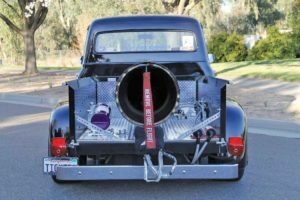 Fast forward 40 years and his son did just that, I put a stainless steel copy of the German V-1 “Buzz Bomb” pulse jet engine into the bed of my 1955 F100! Bob Maddox, the jet go-to-guy for the TV show, “Myth Busters,” built a prototype using the German specs and tested and tweaked the test unit for 18 months to try to better the performance that the German rocket scientists had achieved. As it turned out they were very good at pulse jets, we were only able to match their best numbers. We did build for reliability, not as a disposable weapon. We used stainless steel for its heat resistance and beautiful look, and used nickel alloy valves for durability. Also, we used better fuel pumps and a mist of nitrous as well. The idea really was to build something different, something few had attempted to build. Having been around blowers, turbots and nitrous, I wanted to go someplace new that had potential. I think we hit our target well. It’s unusual and it’s meant to be. I’ve owned the truck for 26 years, and its been finished for 15 years, other than my continuous upgrades, I’m getting older, have less time for it and I’m entertaining the idea of selling it. I can be reached by phone or text at 916-459-8507. 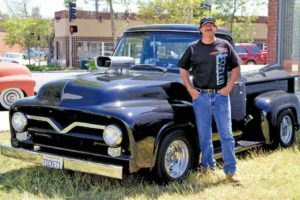 I will tell you that the restoration of the truck was made much easier and faster by the Cruisin’ News Magazine. 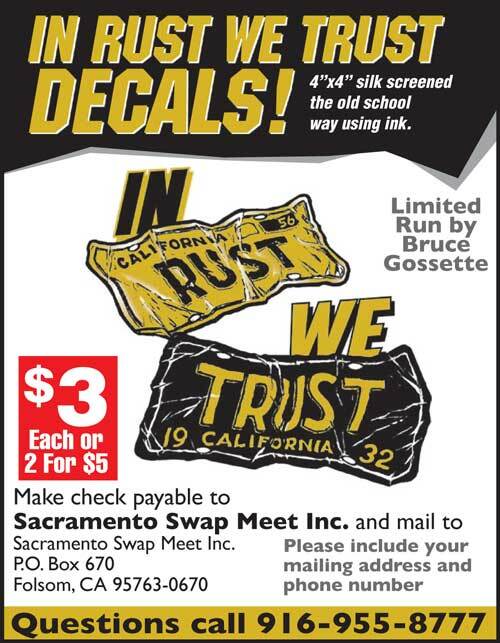 I found a ton of parts at screaming deals over the years, it kept me out of the poor house! Thanks John! (Publisher Note – I’ve known Greg some 20(?) years, when one day I asked on the Cruisin Talk radio show if anyone had a 1967 El Camino rear bumper. Shortly thereafter, Greg showed up at my house with a near perfect bumper for my El Camino that he had pulled off an El Camino at Pick N Pull. That’s how we met and I’ve watched as he built this phenomenal piece of machinery. Then last month, I heard that he was thinking of selling it. I was shocked, but I’ve been seeing this a lot lately … even in my own garage … a need for change. I know the big question is how much is this “jet propelled monster?”. The question is – do you want to go fast? Or do you really want to go fast!! Greg will sell it with the “Pulse Jet” and without the “Pulse Jet.” I asked him how much the “Pulse Jet” would sell for alone. Greg said, “that it would most likely sell for $10,000, just for the Pulse Jet.” So, sit down with Greg and discuss how fast you really want to go. This is one of the most uniquely built Ford Pickups in the world).